John Geza Ashton (born 30 November 1957) is an English musician, songwriter, composer, and record producer, with a career spanning more than 30 years. He is best known as the guitarist of the Psychedelic Furs. John Geza Ashton was born on 30 November 1957 in Whips Cross Hospital, Forest Gate, London, and lived in North Kilworth in south Leicestershire. 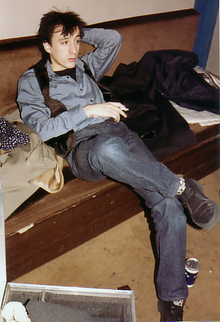 Ashton came to prominence in the early 1980s as the guitarist of the Psychedelic Furs. The band is an English group formed in 1977 by Richard and Tim Butler, Duncan Kilburn and Roger Morris. Their first album release was a hit in the UK and Europe, and they had added John Ashton on guitar and Vince Ely on drums. Their second release Talk Talk Talk placed them on the US charts. Before the release of Forever Now in late 1982, Morris and Kilburn left the band, and Ashton and the Butler brothers went on to release Mirror Moves and other albums. The Psychedelic Furs went on hiatus after their 1992 tour, but reformed in 2001. Since then, Ashton has joined the band on occasion for tours. After the Psychedelic Furs went on hiatus, Ashton became a record producer and worked on a number of projects including Marianne Faithfull, The Sisters of Mercy, Red Betty, and Seven Color Sky. Ashton mixed and co-produced The Secret Post's album From Train to Station, released in 2015, and oversaw recordings with Los Angeles' Silence. Ashton has also pursued a solo career and released his debut album, Satellite Paradiso, in 2014. Ashton moved to the United States around 1989 and is married to Catherine Dewson, a Virginia Beach native. The couple have two children, and currently reside in Woodstock, New York. ^ a b Holland, Brian D. (28 March 2005). "Interview with John Ashton, Guitarist for The Psychedelic Furs". Retrieved 19 March 2016. ^ "John Ashton: Credits". AllMusic. Retrieved 19 March 2016. ^ "From Train to Station". Retrieved 19 March 2016. ^ a b Furneaux, Dave (January 2014). "Satellite Paradiso Interview". Retrieved 19 March 2016. ^ Maisey, Jeff (18 May 2015). "Guitarist John Ashton Talks Furs, Satellite Paradiso". Retrieved 19 March 2016. ^ Semioli, Tom (20 February 2014). "A Psychedelic Fur's Journey to Satellite Paradiso". Retrieved 19 March 2016. ^ Thompson, Dave (2004). Beautiful Chaos. Helter Skelter Publishing. p. 187. ISBN 1-900924-47-1. This article on a UK guitarist is a stub. You can help Wikipedia by expanding it. This page was last edited on 6 December 2018, at 11:51 (UTC).